Working with the Willey-Lilley Team was a great experience. Our home went under contract within one week! Throughout the whole process, communication was smooth and immediate. When we faced an obstacle right before closing, we knew that Scooter was fighting for us and finding a solution for our problem. He really came through for us! I will definitely recommend Scooter and his team to my friends and family. 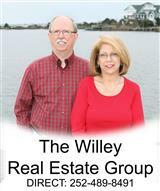 "Hugh Willey is both personable and professional in his dealings with clients. He was readily available to answer any and all questions. Our family enjoyed our dealing with Hugh and would recommend him highly to any perspective client." "It was our pleasure working with Hugh. Hugh is very professional, detail oriented, prompt in replying e-mails and easily reachable over phone. Thanks to Hugh for his excellent market knowledge and insight. Hugh showed us several properties, prepared a Cash Flow Analysis (CFA) document for all the properties we are interested in and provided rental history too. During the home buying process we changed our mind several times to decide on the property. Hugh did not put pressure on us and waited patiently to make our choice." “I would like to commend Hugh for his service to me and my family for not only the house purchase but also the follow-up during recent events with our beach house. Hugh helped us when we discovered the house was without power during a recent trip well after the sale of the house. Top qualities: Personable, Expert, On Time"
"Scooter sold a house for me and went above and beyond to make the deal happen. I have worked with many real estate professionals and Scooter was the most dedicated and driven I have ever dealt with. Top qualities: Great Results, Expert, High Integrity"
"The deal was dead but Scooter wouldn't let it die. He made such a good logical case about the facts that at the eleventh hour, literally, the deal came together. Always expect success with Hugh "Scooter" Willey! Top qualities: Expert, High Integrity, Creative"
"When we decided to purchase a home on the Outer Banks, we were fortunate that we contacted Scooter. He helped us determine what it was we really were looking for, then located several properties that met the criteria. Scooter did not stop working after the contract was signed up, but continued to work for us right up to closing and beyond. Top qualities: Great Results, Personable, High Integrity"
"I would highly recommend Willey-Lilley Team for real estate sales. Scooter is very responsive and went the extra mile to sell my home. He provided various advertising methods not used by other agents to market my home to a larger group of potential buyers. I have enjoyed working with them and would gladly use them again. You will not find a more personable and caring agents to sell your home. Top qualities: Great Results, Personable, Creative"
"I think Hugh is a good agent and understands what is needed to do it (home inspection) properly. I have enjoyed working with him over the past couple of years." "You are such an outstanding realtor. Thank you for all you did for Fran and Bryan (their daughter & son-in-law)! We all love their home!!" "Thank you and Robin both for your prompt, professional and friendly service. It was by chance that we bumped into Robin, but it was a serendipitous event. Scooter we appreciated all the good information you provided (about investing in OBX properties and managing our rental property)"
We feel that not only did Hugh go beyond being an excellent Realtor (based on our previous experience of buying/selling 6 other properties to date) we feel that we have not only gained a house, but a friend. He should be commended and recognized for representing Sun Realty. We will not hesitate to recommend him to all of our friends. “What sets the Willey-Lilley Team above all other realtors I have worked with over the years is their willingness to assist a client long after transactions were complete. Gerri, Scooter, and Robin just don't disappear, but remain with you as "family."